This Classic Carrot Cake recipe is sweet comfort food at its very best. 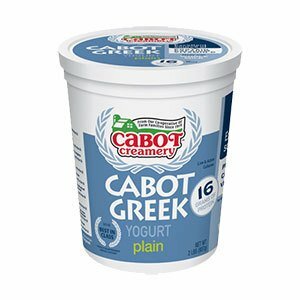 With carrots and pineapple added for sweetness, spices like cinnamon and nutmeg for old-fashioned flavor, and Cabot Greek Yogurt for creaminess and tang, this recipe may just become a family favorite for many years to come. Prefer cupcakes? This recipe will make about a dozen - just remember to shorten the baking time. Whether you make the cake or the cupcakes, please feel free to share the recipe and your pictures with friends and family on Facebook, Pinterest, Instagram and Twitter. For this recipe, you’ll need an 8-inch square baking pan (or a 12-cup muffin tin, if making cupcakes). Many of the ingredients are pantry staples like all-purpose flour, baking powder, baking soda, ground cinnamon, ground nutmeg, salt, dark brown sugar, and pure vanilla extract. You’ll also need crushed pineapples, finely grated carrots, chopped pecans or walnuts, Cabot Lowfat Plain Greek Yogurt (or Cabot Plain Greek Yogurt), vegetable oil, and eggs. Once the batter is mixed, scrape it into your pan and bake for about 35-45 minutes (shorter if making the cupcakes), until a toothpick inserted into the center comes out clean. Cool for 10 minutes in the pan, then turn out onto a wire rack after running a knife around the edges to loosen and let it cool completely. Serve plain or try this amazingly Creamy Yogurt Frosting for carrot cake recipe to top it off! For another delicious carrot recipe, try our Carrot Quinoa Breakfast Bread. It’s a terrific way to get your day off to a strong, healthy start! 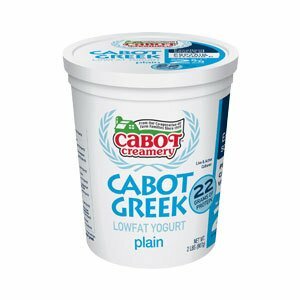 Cabot is a cooperative of over 800 farm families who work together to bring you the highest quality products around. We’d love to hear your feedback on this classic carrot cake, so please rate and review it after giving it a try! PREHEAT oven to 350ºF. Coat 8-inch square baking pan with cooking spray; dust bottom with flour, shaking out excess. PRESS excess juice out of pineapple. Place in small bowl and stir in carrots and nuts. In large bowl, whisk together flour, baking powder, baking soda, cinnamon, nutmeg and salt. Add brown sugar, yogurt, oil, eggs and vanilla and beat with electric mixer on low speed until combined. ADD carrot mixture and beat until well blended, scraping down sides and bottom of bowl. Scrape batter into prepared pan. BAKE for 35 to 45 minutes or until toothpick or skewer inserted in center comes out clean. Let cool for 10 minutes in pan, then run knife around edges and turn out onto wire rack to cool completely. TIP: Serve plain or frost with our Creamy Yogurt Frosting. Many carrot cake recipes make an 9 x 13 which is too large for 2 in my house. This recipe was the perfect size. Instead of an 8 x 8 pan I made a dozen cupcakes and a small 6" loaf pan! (could make about 15 cupcakes) I loved the yogurt frosting as well. Very moist due to the crushed pineapple and no nuts for us! Will add this to the "Very Good" list.